Yield: one 12-inch tart or four 6-inch tarts. To make the dough -- Combine the flour, sugar, and salt; cut in the butter until the mixture resembles coarse crumbs. Add the ice water and toss just until the mixture holds together. Be careful not to overmix. Press the dough into a ball, cover with plastic wrap, and refrigerate at least 30 min. To make the filling -- Trim the ends of the rhubarb and, if the stalks are more than 1 inch thick, cut them in half lengthwise. Cut the stalks into 1-inch-long pieces. 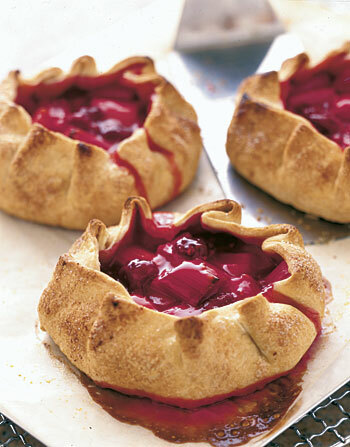 In a large bowl, gently toss the rhubarb and raspberries with the flour and sugar. Let stand until moist, 5 to 10 min. Heat the oven to 400 F. Gently spread the fruit in the center of the chilled pastry, leaving a 2-inch margin around the edge. Carefully fold the edge of the dough over the fruit, pleating it as you go. Brush the edge of the dough with melted butter and sprinkle with sugar. Bake until the pastry is golden brown and the fruit is soft and bubbling, 45 to 55 min. Set on a rack to cool slightly. This rustic tart is wonderful served warm with vanilla ice cream.